Kangaroo Lite 4. Ideal cargo bike for nurseries. 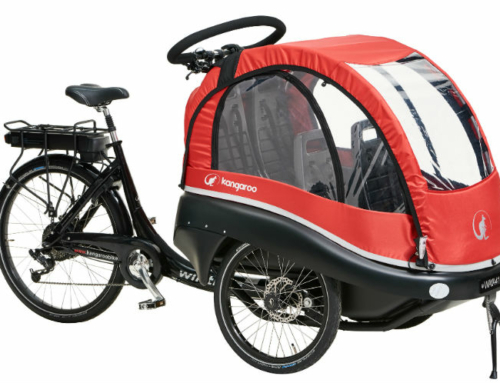 Kangaroo Lite 4 is a preferred cargo bike among child minders and nurseries. It is suitable for up to four children and has everything needed when taking the children out on a ride. From its outset the Winther Kangaroo Lite is designed for transporting children. Up to four children sit protected in the shock-absorbing ABS plastic cabin. The kids are safely fastened with a five-point harness in the special made seats. The two solid alu bars holding the hood provide additional protection over the children’s heads. The cabin is spacious and with rounded corners. The panoramic hood can open both at the front and rear end ensuring ventilation even on a hot summer day. The children can easily climb aboard themselves due to the low entry. This saves the child minder from a lot of heavy lifts. A Kangaroo Lite 4 is easy to ride. A head tube solution and the steering damper forms the basis of the stable ride. The handlebar comes in one position while the seat is equipped with a quick tightener making it easy to switch between users depending on height. The bike is equipped with disc brakes on the front wheels ensuring safe braking whatever the weather. The hood is equipped with reflectors. and comes with disc brakes on the front wheels, puncture resistant Schwalbe tires and 7 speed Shimano Nexus. Seat package including four specially designed seats and other accessories must be specified when ordering, see ‘accessories’. The frame comes in red, black, silver, blue and white. The cover comes in red, black, blue and grey. All colors can be combined. E-solution is available on all our cargo bike models. When you ride with four children we recommend a motor solution. Read more about it here. Dimensions Length: 207 cm, width: 89 cm, height: 114 cm. Cabin dimensions Length: 86 cm, width: 71,5 cm, head height from cabin seat to hood (rear): 62 cm (front): 58 cm.